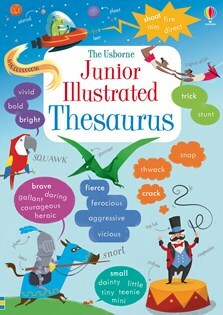 A fantastic resource to help children boost their word power, both when writing and talking. Words and their synonyms are grouped in over 90 topics, including for example, animal words, noisy words, fairytale words, jobs, sports, monsters, weather and lots more. Children can choose a topic relevant for their story, or look for a word in the Word Finder index. Colourful pictures illustrate many of the word meanings, and there are writing tips, word games and internet links to other carefully chosen writing resources online.